If we look at art over the course of time, we see an intricate web of the influences of one artist on another; influences that, in their crossings and re-crossings, eventually weave the tapestry of styles that we call art history. Howard Pyle, who is often rightly called “The Father of American Illustration”, is one of those remarkable points within that tapestry where the threads converge, the design is pulled together, reworked and renewed and influence radiates out in fresh patterns. Pyle revolutionized illustration, both through his own work, which introduced a new level of drama, action and visual excitement to what was largely a staid and restrained art form at the time, and through his influence on his students, who included some of the finest illustrators ever to put lines or colors on a flat surface. Collectively, Pyle and his students helped usher in the “Golden Age of American Illustration”. Pyle’s impact on the art form known as illustration is hard to overstate. His Durer-influenced pen and ink illustrations are among the finest ever done. He was one of the first illustrators to embrace and understand the new four-color printing process, and his paintings are remarkable for their ground-breaking color, dramatic compositions and emotional impact. Among Pyle’s most impressive accomplishments is the list of students that he nurtured, encouraged and influenced in his role a teacher, both at the Drexel Institute of Arts and Sciences in Philadelphia, (now Drexel University), and at his own school in Delaware and plein air sessions in nearby Chadds Ford, Pennsylvania. 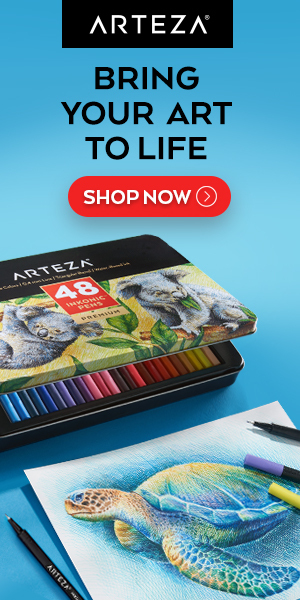 The list is resplendent with great illustrators like N.C. Wyeth, Maxfield Parrish, Frank Schoonover, Harvey Dunn, Phillip Goodwin, Stanley Arthurs and many others. At a time when it was highly unusual for women to train in the commercial field of illustration, over forty of Pyle’s 100 or so students were women, and included such amazing illustrators as Elizabeth Shippen Green, Jessie Wilcox Smith and Violet Oakley. Green, Smith and Oakley collectively came to be known as “The Red Rose Girls”, and are sure to be the subjects of future posts as they are among my favorites. Pyle’s influence extended through his students to their students, and well beyond. The great Dean Cornwell, for example, was a student of Pyle’s student Harvey Dunn. Even though the art establishment and upper class snobs were already starting their scurrilous campaign to denigrate illustration as somehow inferior to “fine art” (a bit of class warfare that continues to this day), Pyle’s influence was felt in other artist circles as well. Vincent van Gogh collected clippings of Pyle’s illustrations from Harper’s. Rather than try to write an entire book here, I’ll provide some links below to Pyle information and resources on the web. There are also some wonderful print resources of Pyles work. A good place to start might be Visions of Adventure: N. C. Wyeth and the Brandywine Artists by Walt Reed. Although it is not about Pyle specifically and features his brilliant student, N.C. Wyeth, more prominently, it is a terrific book that serves as a good introduction to the Brandywine School, puts Pyle in context and includes wonderful images by Pyle, Wyeth, Dunn, Schoonover, Gooodwin and Cornwell. In the context of my point about Pyle’s place in the history of illustration, I would recommend a couple of other excellent books that include good sections on Pyle as well as showcasing many of the other greats of Illustration: America’s Great Illustrators and A treasury of the great children’s book illustrators, both by Susan E Meyer. Pyle was an accomplished writer as well as an illustrator. Look for the wonderfully inexpensive Dover Books editions of the books that Pyle both wrote and illustrated in his luxurious pen and ink style: The Story of the Champions of the Round Table, The Story of Sir Launcelot and His Companions, Otto of the Silver Hand, The Story of the Grail and the Passing of Arthur, and many others including The Wonder Clock, from which the pen and ink drawing above is taken. I’ve been visiting his paintings and drawings in the Delaware Art Museum, which houses the largest single collection of Pyle’s work, and, to a lesser extent, in the Brandywine River Museum, for so long that I’m sometimes tempted to take him for granted. 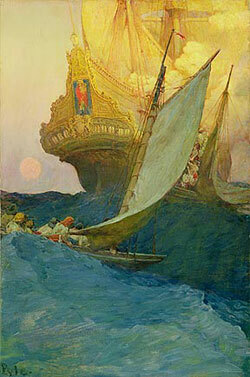 But every time I walk into the Delaware Art Museum and stand in front of Marooned, or Attack on a Galleon (above, left), I can feel those invisible strands of Pyle’s influence reaching out through generations of artists, and I’m reminded that you simply can’t take Howard Pyle for granted. 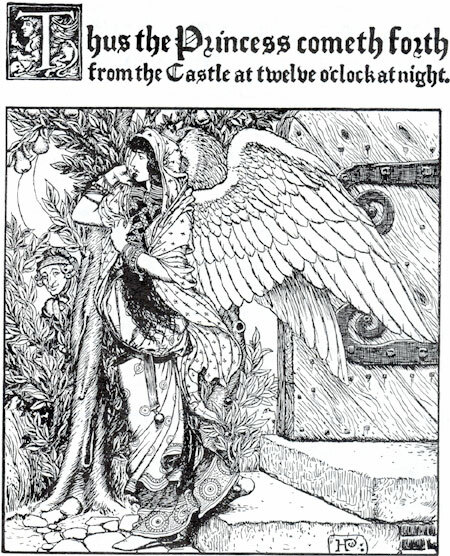 Howard Pyle rules; one of my favorite illustrators from way back; I used to seek out his books of fairy tales just for the drawings. Strangely enough, I discovered Pyle through a book about Norman Rockwell; who, although he seems reviled nowadays for being “kitschy”, I thought was a great illustrator as well. I just recently found out about Howard Pyle & his star pupil NC Wyeth. Amazing painters/illustrators with profoundly new approaches to the trade. I’ll will definitely be researching more on these two, as well a studying their styles & techniques in a more in depth manner. About fiftee-years ago I found a large (57″ x 33″), and very old, framed oil on canvas painting (An attack on a galleon)in an alley in St Paul, MN. In the bottom left hand corner its signed, PYLE, and 1905. I recently began to do reseach on it, and found out that the original is in the Delaware art museum’s collection. Normally my investigation would have ended there, BUT, I noticed a name on the back of the frame – C.W Wyeth. I know of the Wyeth family, but have never heard of C.W. I’m sure that Pyle was in St. Paul around the time of 1905, Painting the state capital mural. My thought is that one of Pyle’s students painted it. But, who knows. Any info would be appreciated. I’m uncertain about the middle initial, but CW Wyeth might be Carolyn Wyeth, N.C. Wyeth’s second daughter and elder sister of Andrew.